Twitter is one of the best social networking sites for generating leads.Â Your online reach is not watered down, unlike Facebook. It has a better reach than Google+. It relies more than just images, unlike Pinterest and Instagram. That said, let’s cut to the chase. Below is a short guide on how you can find potential customers on Twitter. Finding your target market from the wall of tweets online will be difficult. Instead of going through it this way, you should reverse-engineer the search. You must find your main competitors first. Identifying them allows you to narrow down your search to these users. 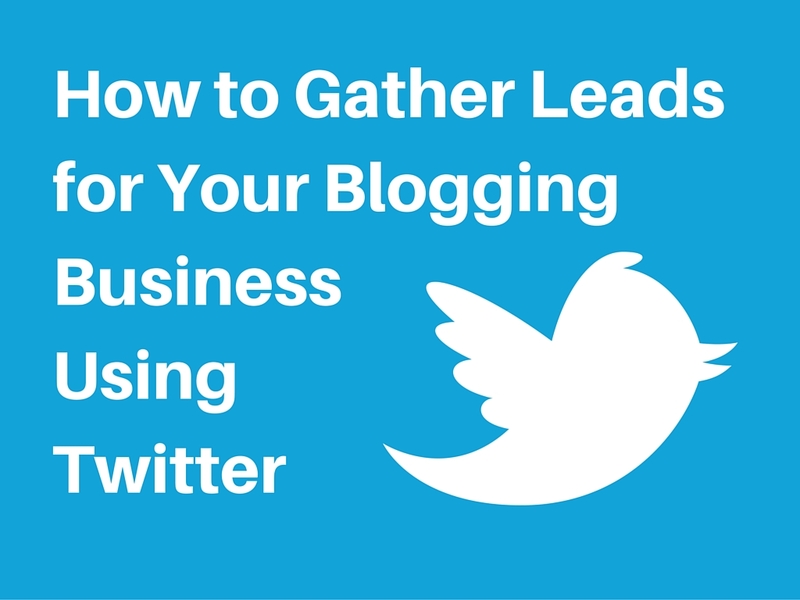 That way, you won’t have to aimlessly look for Twitter leads all over the place. Before doing this, you need to establish your target keywords. This will help make searching for your competitors much easier. If you have a landing page, you can enter that instead. Once searched, you will see keyword suggestions that you can use for your project. The monthly search volume has more to do with Google than Twitter. But it would be ideal to choose keywords with the highest search volume. You can use them later if you decide on optimizing for yourÂ site pages. Use the keywords to search for your competitors. Look for accounts that are in direct competition with what you are offering. There may be accounts that match the keywords but are not your competitors. Therefore, you will need to manually look at each account to confirm this. From the search I conducted, there is only one account that I would consider as a competitor. Search for all your competitors using the keywords you have chosen. Compile the users in a spreadsheet. Open Followerwonk andÂ click on the Analyze tab. Enter the Twitter handle of your competitor and analyze their followers. These factors will help you determine the most active and influential users who follow your competitor. What you want to do is follow these users. This helps you narrow down the choicesÂ of possible clients based on how active and influential they are. Set a baseline from each factor and follow the users who meet your standards. For example, filter users with Social Authority of at least 51%. The number is arbitrary. The point is that you do not want to follow users who are inactive and haveÂ a small following. Do not follow all users in one fell swoop. Follow a maximum of 10 users a day to avoid suspicious activity on your part. Once you have followed a substantial amount of users, now is the time to engage with them. Building relationships with these users can help increase your influence as well. During this process, you can determine which among the users are most likely to become your blogging client. You can start by monitoring your Twitter Stream for tweets that you can use a starting point for discussion. 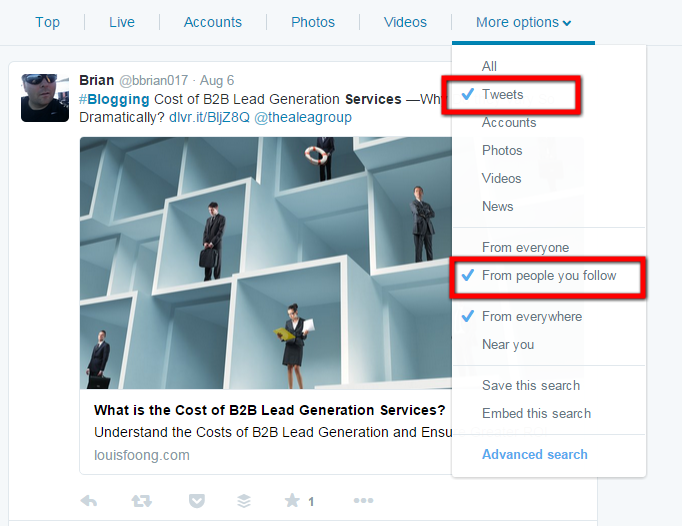 If your Stream gets too crowded, you can refine your process by using advanced search options to narrow down the tweets. What you want to see are tweets that contain your keyword. There is a great chance thatÂ you can use these tweets to engage with them. Retweet or favorite it – Doing this on a regular basis informs them that you are following their activity. This puts you within their radar and will become familiar with your account. Suggest similar content – Reply back with a post that is just as helpful (if not better). 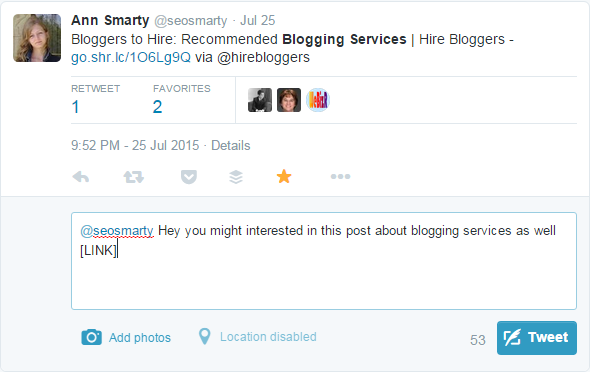 It would be better if the content you are suggesting came from your blog. Create similar content – If you do not have an existing content that is similar to the shared post, create one. Read the post and find gaps in the information that you canÂ elaborate in your own article. OnceÂ published, share the content on Twitter and tag the user. 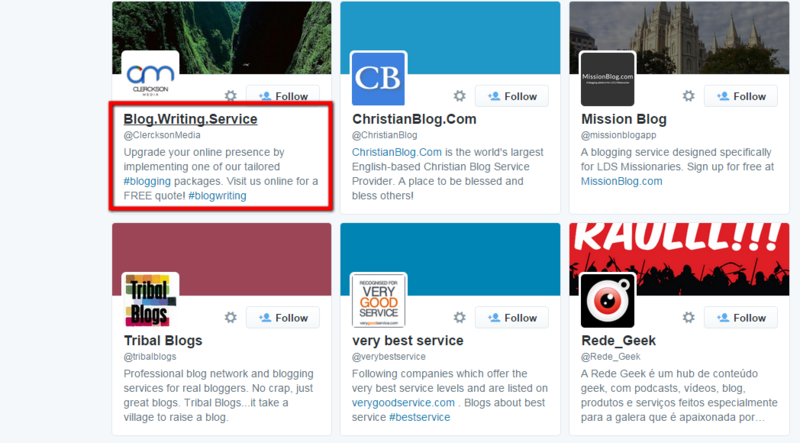 If you noticed, there is no part in the article where you are promoting your blogging services. What we are doing here is planting the seeds so users become much more familiar with your business. This is the reason why you do not want to hard sell your services. Instead of being pushy and annoying, you want toÂ provide value to them. Building your influence with the users you are following by way ofÂ engagement, you earn their trust. Once they trust you,Â they will start visiting your site or blog. They will browse through your services and portfolio to see if you are a good fit for their needs. As a result, this process may take more than a couple of weeks or months to accomplish. But this non-disruptive approach to getting clients should help build your business on Twitter. It is all about giving value to your customers nowadays, and the tips above does exactly that. Write an informative Twitter bio and link back to your website. This way, users will have a better understanding of your services. If interested, they can just click on the link to your site. Improve your landing page. Showcase your writing portfolio. Display testimonials of your previous clients. Include a contact form so they can learn more about your services. That’s the wrap! If you have suggestions on how to build leads off Twitter for your blogging services, comment below.